Suspicious Heuristics: Is Hoarding a disease, or just un-economic? Some advice for the cluttered. Is Hoarding a disease, or just un-economic? Some advice for the cluttered. 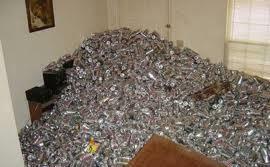 Who doesn't need 70,000 empty beer cans? People with their finger on the pulse of reality TV (like myself) are shocked and disgusted by the spate of shows surrounding the issue of "hoarding." For the unexposed: the premise of such a show is that people with a serious clutter problem ("hoarders") ask for help from the reality television deities to clean their places. Then, the audience gets to be amused and disgusted as the hoarder whines, moans, and otherwise impedes the cleaning crew from taking out the junk. Apparently it's a successful formula, because several different networks are now doing "Hoarder" themed shows. Economics does a lot of theorizing about consumption, and generally the assumption is that more = better. Presumably, a person will only buy something if it makes them happier or brings them some sort of utility. TV about hoarders is a case study in diminishing returns from possessions. In other words: the first 10 antique lamps and teddy bears were wonderful, but after there are 500 and you're sleeping on a single chair while living in fear of death by trash-alanche, then more stuff has become a dis-utility. While the hazards of living in a house overstuffed with molding garbage seem all too apparent from an outside perspective, to a hoarder this can become normal or even desirable. On the show, the hoarders often strongly resist parting with anything, even if its broken, useless or unsanitary. Some have strong emotional attachments to objects other people wouldn't give a second glance. As one woman says to her daughter, who's trying to throw away rusted garbage on the lawn: "Well, you're not always here. The stuff is always here!" [paraphrasing]. When people choose objects over their family, it's easy to consider it a disease. The problem is, the "disease" analogy (especially in the case of hoarding) takes agency away from the people with the clutter problem, and allows them to blame a messy house on factors "out of their control." In reality, there's nothing you have more control of than what you choose to purchase and keep in your home. If a person can't imagine themselves in charge of their own possessions, how can they run any part of their life? Lots of people have a little clutter. Lots of people have sentimental attachment to their items. It's when these are taken to an extreme or inconvenient level that it's classified as "hoarding." It's tough to separate out the 'clinical cases' who need outside assistance from the 'messy people' who just can't be bothered to clean up. The danger is, as psychologizing clutter becomes more popular, more borderline cases may choose the shrink instead of the dumpster. I'm moving across the country in a few days, and I can say for sure: nothing makes you think about valuing your things like paying to send them someplace. A lot of items - books I'd already read, old CD-ROM computer games, a large selection of cheap kitchen appliances - had to face the "postage cost vs. future enjoyment" test, and quite a few didn't pass. Watching Hoarders, I'd always had a little contempt for the people who couldn't give up anything. Now, I can relate a little more, as I've had to cut my possessions down or risk balancing the USPS budget deficit by myself. It was a lot of work clearing out my one bedroom apartment; hard to imagine downsizing a whole house. One positive aspect I've found: giving stuff away is fun. Either it goes to someone you like so they can enjoy it, or it goes to someone you dislike and clutters their place up instead. I've never considered myself much of a "better to give than receive" sort of person, but it's been enjoyable lately to clean out my unneeded possessions. Reconsider spending habits. On the show, lots of people describe how they get a rush from the purchase and then don't know what to do with the item. Sometimes in periods of stress it's reassuring to buy new things, but this isn't a sustainable strategy. Only purchasing stuff you have an immediate use for is a better use of money than funding a yacht for every yard sale in town. Try the "postage vs. enjoyment" experiment for yourself. Imagine you had to pack all of your belongings and pay to ship them, or leave them behind. What would you bring? Which items are easily replaced, you have a lot of, or no longer need? The result should be some hierarchy of what you value the most, and hopefully a lot of items that aren't worth the hassle anymore. Just clean up. Seriously. Start in a small corner, then work outward. Many of the hoarders wanted their place clean, but they got overwhelmed and couldn't do it. Overcome this mental barrier by setting small, achievable steps (insert generic self-help advice here). It seems fitting this is the last post I'll make before packing my computer in a box and shipping it across the country. I'm sitting in an empty apartment now; the only furniture left is my desk, a chair, and an old dishwasher. All I can say is... don't you wish you were so lucky? I agree that there is a problem with the disease metaphor in this case and in any number of other contexts, precisely because of the way that, as you say, it removes agency from the equation. But, as someone who has had some pretty serious problems with slightly different sorts of obsessive behavior (disordered behavior, if ever there was such, and behavior that is clearly irrational even at the time it is performed), I think most serious hoarders, agents though they be, probably cannot overcome their behavior without someone else to help them, to be agents along with them. The problem with seeing it in more purely economic terms, is to think that if someone sees that her behavior is irrational, she will automatically stop it, but this reduces human psychology in a way that doesn't reflect reality.